RDz Content Assist provides a facility to insert code fragments through templatized statements. RDz Statement Templates are code fragments (as small as a single statement or as large as an entire program). Code Templates are pieces of reusable code that are defined in RDz’s Preferences menu . 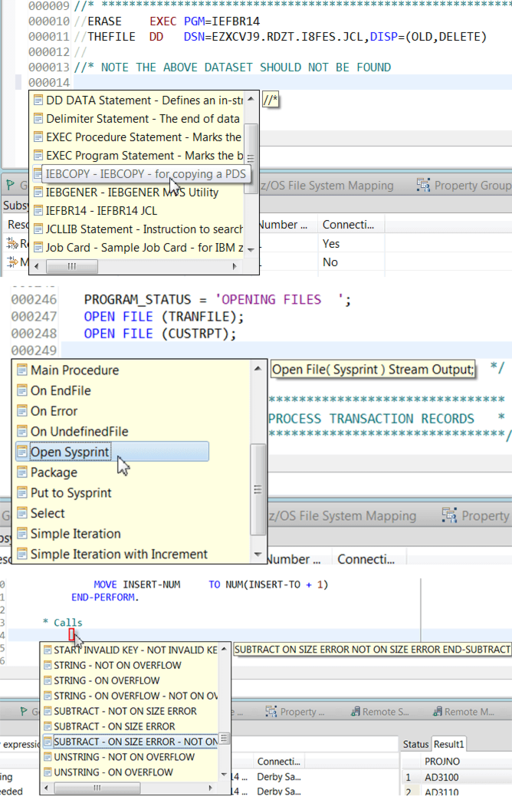 Code Templates are language sensitive, and available for; Assembler, PL/I, JCL, COBOL, and SQL. They can be used for small/granular development components such as single statements or keywords (that’s what’s shipped with RDz). With each purchase of the Code Templates you will receive a Readme.doc file that provides instructions on how to unzip/import/and share. (Note that this is simple XML file Import/Export process.